The School of Education strives to create an environment where all participants are critical, creative thinkers, problem-solvers, life-long learners, and global citizens who advocate and work for justice and equality as they pursue their professional roles. Our Conceptual Framework (pdf) represents three different dimensions of the academic experience. 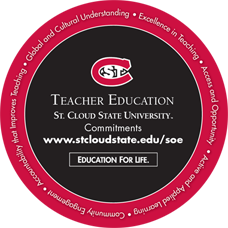 First, the red ring demonstrates our institutional and unit commitments to: excellence in teaching, access and opportunity, active and applied learning, community engagement, accountability that improves teaching and global and cultural understanding. Through these commitments we prepare our teacher candidates for the roles of teaching, leading and serving. 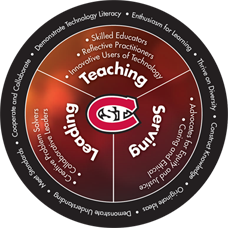 As our central mission, (depicted in the center of the diagram) we transform candidates and support our faculty as co-learners to become: knowledgeable and skilled educators, reflective practitioners, caring and ethical professionals, innovative users of technology, creative problem solvers, collaborative leaders, advocates for equity and justice in education and caring and ethical professionals. Our candidates, in turn, will lead the P-12 students in their classrooms to: display inquiry and enthusiasm for learning, thrive on diversity, construct knowledge and originate ideas, demonstrate understanding, meet well-defined standards, cooperate and collaborate in multiple contexts and demonstrate technology literacy. Developing educators who understand instructional strategies, planning and assessment and use their content and pedagogical knowledge and skills to inspire P-12 learners to move beyond learning the current “facts” to being able to put knowledge together in new and creative ways. Developing collaborative leaders who understand that teaching is no longer a solitary activity within the walls of a classroom, but depends upon working in a collaborative manner with other educators, professionals, families and community members. Developing educational leaders who advocate for both individual students and groups of students who may face social injustices in our society. The teacher preparation programs at St. Cloud State University have been nationally accredited by the National Council for Accreditation of Teacher Education (NCATE) since 1954. Accreditation by NCATE demonstrates that our programs meet rigorous standards with regard to the preparation of high quality teachers, education specialists and administrators. Our programs are also approved by the Minnesota Board of Teaching. Effective July 1, 2013, NCATE and Teacher Education Accreditation Council (TEAC) have formally merged, resulting in the Council for Accreditation of Educator Preparation (CAEP). Moving forward, CAEP will be the sole accrediting authority for educator preparation programs. St. Cloud State is scheduled for an accreditation visit in early 2015, which will focus on addressing the NCATE standards. As we transition from NCATE to CAEP accreditation, St. Cloud State will continue to meet the standards set forth by NCATE while referring to the proposed CAEP standards in our accreditation process. We are proud of our educator preparation programs and welcome the opportunity to strengthen our work by meeting rigorous national standards. After our 2015 NCATE visit, our teacher preparation unit will fully transition to the CAEP standards.